KUMAR & CLARK!!!! 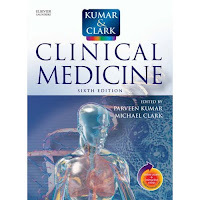 A must have book for medicine. This book rich in information about Investigation and suitable text or reference when you want to do a discussion for your case summaries!! Eventhough the book's name - medicine, it also include surgery and psychiatric topic. The psychiatric topic inside is sufficient for a medical student to pass the exam!! So throw away your oxford psychiatric book and Buy it now! Cool?? for me it's just an ordinary blog dear.. nway, nice to meet you! i love cats too.. hehe..